Snippets of my brilliant life, on a pension. We've had a wet few days, flipping annoying when you want to go out. Every morning I look out of the window and think, should I go out today, then the heavens open and that answers my question. However, this morning it didn't look too bad so I decided to go for it. 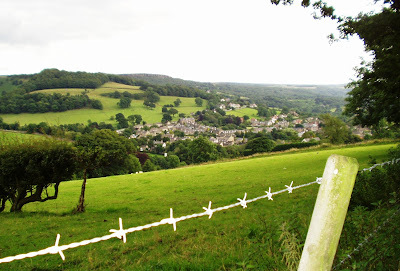 I set off at 10.30am, battled my way through Sheffield, and arrived at Hathersage at 12noon, 53 miles away. The peacefullness of the countryside was a relief after all that traffic earbashing. I found a quiet street to park. 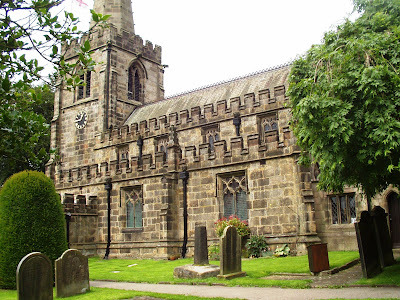 Hathersage is in the Derbyshire Peak District, on the A6187 between Sheffield and Chapel en le Frith. I took an Ordnance Survey map with me and had a good idea of the route I wanted to walk. I always think it is better to plan a bit rather than wandering around aimlessly. I also like to keep a record of my walks. The map of my local area has almost every footpath highlighted with a marker pen, I have walked them all. 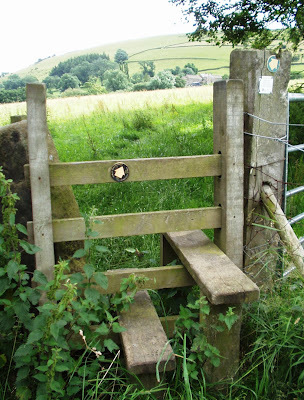 I love map reading, and looking for the paths and stiles on the ground, a sort of adventure, and of course the bonus is the fantastic scenery. 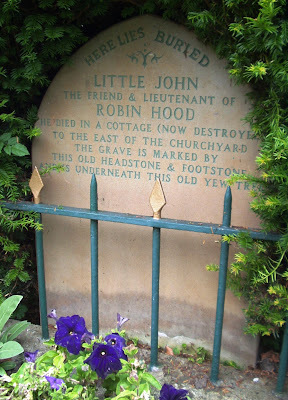 I walked up the hill to a church I spotted and found it was where Little John is buried, friend of Robin Hood. Here is the church and gravestone. Following my map I climbed the hill through a mixture of pretty lanes, farm tracks, open fields, and through woods. I bleated at the sheep, and nudged a few cows out of the way so I could pass. At one point I passed round the edge of a golf course, and stopped to help a man look in the hedge bottom for his lost ball, ha ha. I headed towards Bamford then crossed over the main road and the river. Passing Offerton Hall, a big posh farmhouse, I lingered a few minutes and wondered what it would be like to live there, it must be wonderful. This is my route. 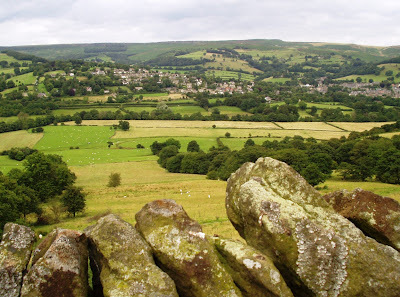 Hathersage is in a valley and the scenery is fabulous the higher you climb, you can see for miles. This is my spiritual home, anywhere up in the hills is heaven to me, wandering around the countryside, it's like I have a calling, a need to connect, and I have to do it by myself. I will come back to this area, a few miles further north is Ladybower Reservoir, worth a look I think. I've been looking after Henry for a couple of days, at his house. You may remember I stayed with him for a week not so long ago, while my friend Helen went on holiday. He completely wore me out when I discovered that a Labrador puppy eats just about anything. In the space of five weeks he certainly has grown up a lot, in size and intelligence, what a handsome boy he is now. I can see that Helen's perseverance with dog training classes is paying off, and he isn't half as unruly as he was. He understands all the basic commands, and I can see that he will make a perfect companion. When I speak to him he listens intently and looks into my eyes. He recognises a lot of words, and will sit and offer his paw immediately when he knows a treat is coming his way. Yesterday we went a walk across the fields, he picked up the scent of something in the wind and his nose twitched, and his ears pricked up as he listened. If he was off the lead I think he would be charging across the field after something, but we didn't have much time. It's obvious he has an appetite for learning, for adventure and excitement. We only had a short walk today because it has been pouring with rain all day, so I made up a game to play indoors. I put him in another room so he couldn't see where I was hiding some of his treats. Then I let him back in and encouraged him to 'find'. 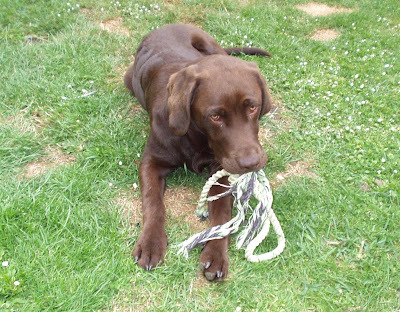 His tail was wagging with excitement as he found each one, what a clever boy. I am glad that Henry is growing up, I can see that he will be a lot of fun. Richard at http://www.downthelane.net/ has given us a bit of a challenge, it's a competition so there is a prize for the winner. We have to come up with a good idea to make something out of pallets, draw a plan and assemble it. 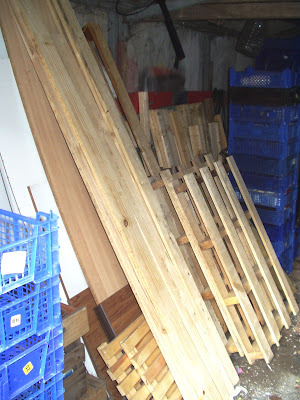 Today I have been taking my pallets apart, not an easy task. I gathered my tools for the job, a big club hammer, a hammer with a nail claw, a big screwdriver, and a chisel. The idea is to dismantle them without damaging the wood. I had three huge pallets, they were about six foot long, they were in my garage so the wood is nice and clean. I managed to get them apart but I think it would have been a bit easier if I had a crow bar. Here is my pile of wood. I have a lot more wood in the garage, but I think it's ok to use it for the project as all of it was free, salvaged from skips or work. Now I need a good idea, I'm not sure whether to make something for the outdoors or indoors. I have a sander and some varnish so I suppose I could make a piece of furniture. No hurry we have got a month or two before the competition closes, I'll have a look round a few web sites. 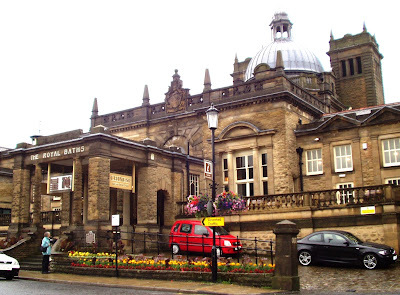 I set off this morning to go to Derbyshire, and stopped off at the car boot sale on the way out. I thought I might find a pair of trainers as mine are nearly at the end of their usefull life. I want black or any dark coloured ones, not those impractical white and pink ones. Found some but unfortunately the wrong size, never mind. Someone shouted 'everything 5p in this box', so I had a nosey through it and picked out a nearly new, white leather belt, bargain I thought. I felt spots of rain, and not a bit of blue in the sky. The rain got heavier and everyone started packing up and leaving. Not much fun walking in the rain, I thought, so I went home. So to plan B. 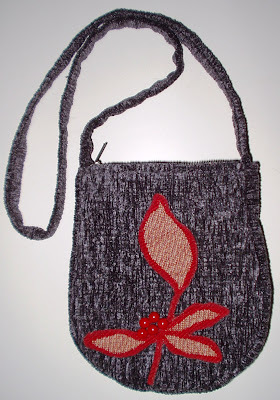 Make a bag. I had some upholstery fabric offcuts from the Scrapstore, and found a template for a bag in a magazine. I cut two pieces back and front, a 2inch wide gusset, and a piece 2.5inches wide for the shoulder bag length strap. Before I stitched it together I put the decoration on the front. The red leaves were cut from another piece of upholstery fabric, I then painted the edges with clear nail varnish to stop it fraying. After sewing it on I put more varnish on to make sure it definately wouldn't fall apart, and then I added five red beads. I made the lining out of some thin grey fabric. The ends of the strap are sandwiched between the outer and inner layers, and luckily I had a black zip of the right length.Here is my new bag. It looks lovely, I am really pleased with it. the measurements are 7" by 9", and 2" deep. 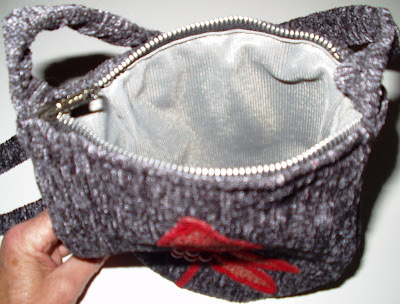 Enough room for essentials, purse, phone, keys, etc. So the day was not wasted, I will get to Derbyshire one day. I couldn't decide whether to go out today or not. 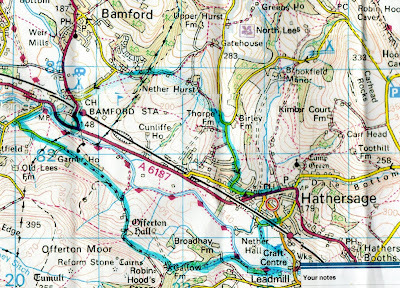 I looked at the map and thought I might go to Derbyshire, so I put the computer on and printed off some os maps of the Hathersage area. But, by the time I had checked Down The Lane Forum, clouds had started to drift over, and they said it might be showery in the afternoon. Perhaps I will work in the garden instead. 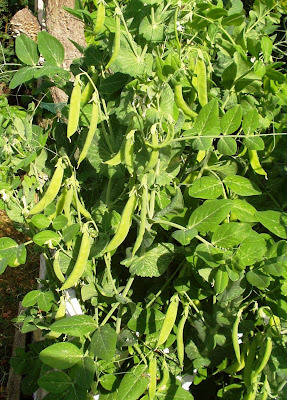 Some of the peas are ready for taking out, I have them in plastic boxes on a pallet, which I built a frame round and covered the sides in shrink wrap, so it's quite easy to move things about. This left me with a space and as my tomatoes are rather cramped and not getting enough light, I was able to move some of them onto the pallet to make room to move the others about. The compost I had left from the peas I spread on the tomato plants, then I went round them all trimming some of the leaves off. 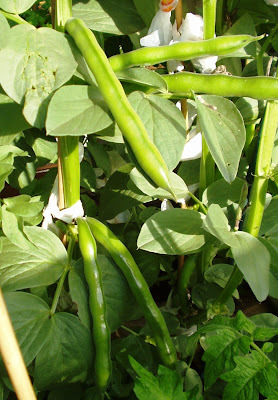 The broad beans are nearly finished now so I cut the tops off some of them, they want taking out in the next few days, I can't be bothered to do it now. The compost heap is growing, a good time to add some of the shredded paper. There seems to be spuds and tomatoes sprouting up everywhere, that will teach me not to throw the potato peelings and rotten tomatoes on the compost heap. It looks like the hedges need a trim, so I got the shears and step ladder out and made a start. The hedge at the bottom of the garden is too high for me to reach all the way across the top, so I will have to go and ask the people in the bungalow round the corner if I can go into their garden to finish it off. Maybe next week sometimes for that job. I knew I should have worn something with sleeves for the hedge cutting, now my arms are sore and stinging with red blotches, from leaning over the conifers. 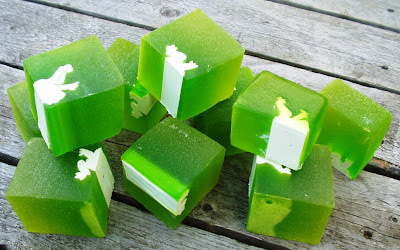 I smothered them in aloe vera jelly and that made them sting more than ever, ouch! 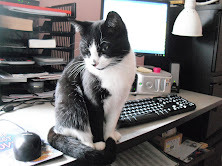 Well I don't know what's been going on, I haven't blogged because I have been unable to get logged in. I changed my email address because I am getting massive amounts of spam, then blogger said I have the wrong password but I know it's right, it couldn't send me an email to verify the password, I was just about to tear my hair out and scream and cry, and low and behold I tried it again and here I am. These computer things baffle me, anyway, lets get on with it before it decides it's going to cut me off. 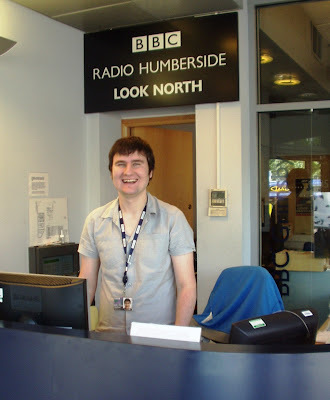 I wanted to tell you about my radio interview today, I went into BBC Radio Humberside at Grimsby, to chat with Lara Croft on the morning show. She comes on from 9 till 12. 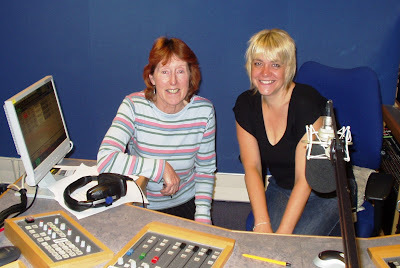 This is my third time on her programme, I think she likes me because I am a chatty person and we have a lot of fun together. I took her some potatoes fresh out of my garden which she was very pleased about. The chat is about topical subjects from the newspapers and I am given a cup of coffee while I browse through them to pick out my snippets. I had made a few notes to give her as well about what I have been doing, just to give her some ideas. It is so easy to chat with Lara, we are sat opposite each other in the studio and I follow her lead, answering her questions and adding what I think is appropriate. The whole thing lasts about half an hour, during that time she breaks off to do the weather, traffic reports, and jingles, and I carry on browsing the papers. Some of the chat was about my moderating duties on http://www.downthelane.net/ on the forum, she was interested in Battery Hen Rescue as she is very keen on happy chickens laying free range eggs. Then I told her about my skip diving, and collecting stuff for the Scrapstore. We finished off with a couple of items from the newspapers. If you want to listen the whole programme is on the iplayer here, I start about 18 minutes into it so you need to scroll forward. 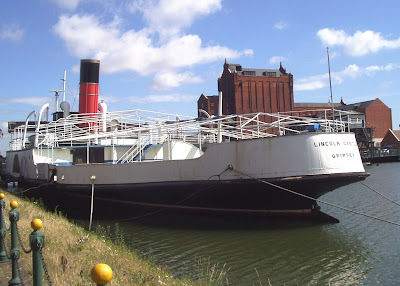 Afterwards I went for a mooch around Grimsby. This boat is moored next to the Fishing Heritage Museum. 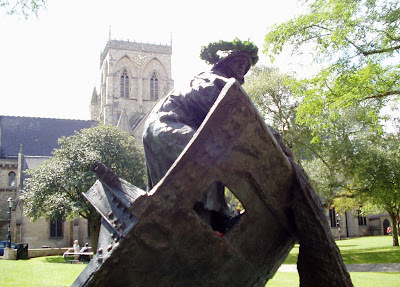 This is a monument of a fisherman pulling his nets up over the side of the boat, outside St James's church. Around the base people had placed floral tributes to those fishermen who were lost at sea. I spent a few quiet moments inside the church to reflect on how lucky I am to be able to enjoy this lovely sunny day. On the way home I stopped off in Immingham to visit Sheila, Jackie, and Anna, at the agency I used to work for. It was great to see them again and catch up on the news. I told them about the collecting I do for the Scrapstore, and they said I should go and ask the company round the corner that makes blinds, because they are very nice people and might have something to give me. They were indeed very nice people, and they gave me a load of end of roll, blind fabrics, all colours, I was very excited about this because I know they will be very much appreciated. I delivered my load on the way home and Lorraine was over the moon with it. We immediately cleared some shelf space in a prominent position for the rolls. I am sure I will be going back for more at some point, they said I could call in any time. A good ending to an enjoyable and productive day. Well I always said I would never retire, as long as I can climb in and out of a cab with my zimmer frame, I would keep on trucking. I was up at 5am this morning, and started work at 7am. 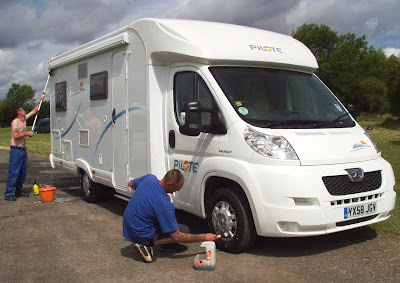 The motorhomes we took to Pickering on Tuesday all had to come back again, so it was two trips in the mini bus, one lot went to the Laceby depot near Grimsby, and the others went to the Colsterworth depot on the A1 near Grantham. The sales team had a good weekend, they sold 20plus vans, amazing in this credit crunch when people are supposedly short of money. 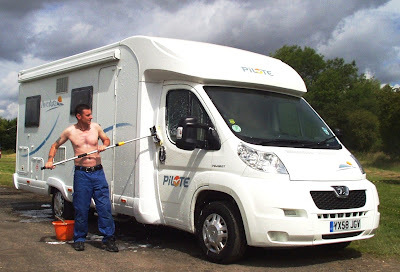 I think holidays in England are becoming more popular, and a motorhome would give you reasonably priced holidays for a good few years. Then you could sell the van when you have finished with it. The guys I work with are a happy bunch, we always have a good crack, jokes are flying about thick and fast. Of course I join in with all this banter, I can't help it. They start it by teasing me, and I come back with a cheeky answer, then I get drawn into my story telling. At one point they were all doubled up with laughing and the driver nearly drove off the edge of the road he was laughing so much. I admit I can get away with a lot more silly chat as I am the only female. It's great, they treat me as one of the boys. Nothing bothers me, they know I have an answer for everything, and will give as good as I get. I love it when I make people laugh. We got finished at 7pm, glad to get out of the mini bus and stretch my legs, I have been sitting down all day, not good for keeping up the fitness levels. I am not sure how long soap lasts before it deteriorates, but I think I have got enough to last me for the next ten years. I used to buy in hand made soap from a small family business, and sell it on at craft fairs and agricultural shows. Sales were slowing down and it was no longer worth doing all the work for so little in return, so I closed my business over two years ago. I sold off nearly all my stock at a much reduced price. I thought it was silly to let it all go, so I kept a large 2.2 kilo block back, with a fresh lemon and lime fragrance. It was in a drawer for a long time, the drawer smelt lovely, and a year ago I got it out and cut it into big chunks. I had the idea of using it as a room freshener, so I put it in plastic trays, and dotted it around the living room. 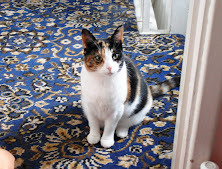 It worked, the room smelt much fresher, a big improvement on the feline smells that sometimes wafted through. Sadly now the fragrance isn't quite so strong so maybe now is the time to start using it for it's original purpose. I think it's going to last me a long time, it still lathers up well, I wonder what it will be like when I get to the last piece? Will it still smell fresh, will it still be frothy? I was determined to have a day out today, as it is exactly one year since my operation, I tell everyone I had my gearbox out, ha ha. So to celebrate my recovery I drove to Wetherby in North Yorkshire, where I stopped for a fish and chip lunch. Might seem odd to choose a chippy but this is a treat for me, I only have fish and chips about three times a year, I don't do fried food. 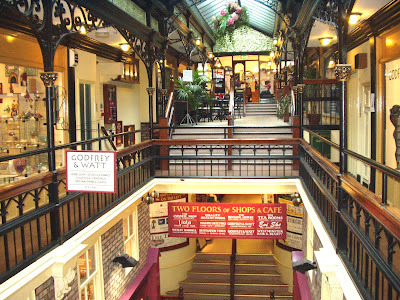 This Victorian shopping arcade is lovely. 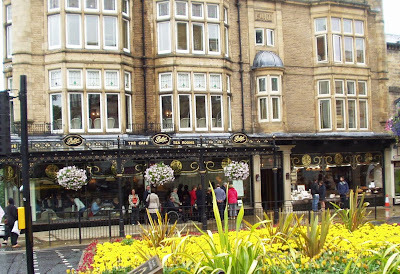 It's on two floors, with shops selling fine china and ornaments, pictures, and expensive furniture. I was a bit disappointed that some of the beautiful buildings have been spoilt with modern signage, this is a Chinese Restaurant. With my feet thoroughly soaked by now I headed home, thank goodness I had put spare shoes and socks in the car. As I was passing Tesco I called in to do a big shop so I could use my £6 off voucher. I needed to make it to £40 so I carefully recorded all the prices as I added the items to the trolley. There were several reduced price items from the chiller, the veg, and the bread counters, and when I had almost finished, I went back to these counters to see if they had added anything else. I was lucky, they had, but they had also reduced even further some of the items I had already chosen. I hope no one was looking when I did a quick swap. The best prices were, smoked salmon slices from £2.49 to 62p, washed lettuce from £1 to 25p, spinach from £1.50 to 38p. A good end to the day. This is a doggy post, because I have been walking dogs for most of the day. 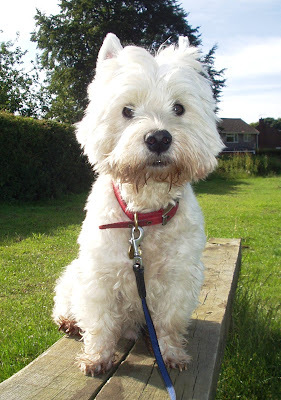 My friend who lives round the corner has been in hospital for a couple of days, and he asked if I would walk Teddy. Of course I will, I love dog walking. 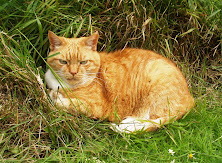 Yesterday we had four walks, and he came to visit my cats for an hour, they were not impressed, they scarpered. Today we had three walks, Tony came back at 6pm, so he didn't get the fourth walk. This is Teddy. He is so funny. He stops to look at something, then makes a mad dash, then stops again when something catches his attention, then runs off again. He is so entertaining, and what a cutie, couldn't you just fall in love with him! 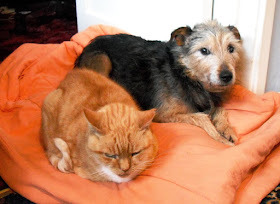 After lunch I went to Winteringham to help my friend Helen walk her dog Henry, and the next door neighbours dog, Alfie. This is Henry, you may remember I stayed at his house and looked after him for a week recently. 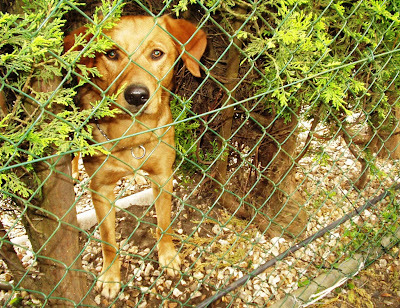 And this is Alfie looking through the fence, saying please take me for a walk. 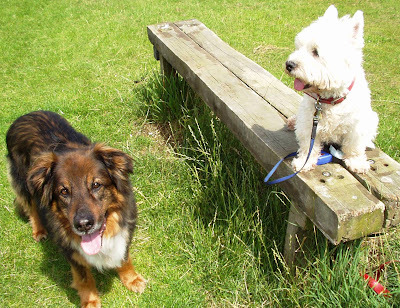 These two dogs are great friends, and Helen often fetches Alfie into her garden to play with Henry. We took them in her car to a quiet lane where they could both play off the lead. Helen threw a ball for them to chase, unfortunately her aim was not too good and it disappeared into a corn field. Neither dog could find it, and we were wading around in the corn looking for it when a tractor came along. I don't think the farmer was too impressed with all of us destroying his crop. The ball was lost, but thankfully Helen had a spare in her bag, and the game was resumed. I was up at the crack of dawn today, drive twentyfive miles, pick up a motorhome and deliver it to the Showground at Pickering in North Yorkshire. It's the Northern Motorhome Show this weekend, and Timberland, the company I work for is taking 50 vehicles. I call this my hobby job because it gives me a day out, today I went over the Humber Bridge to Beverley, then took the B1248 through the Wolds, to Malton and Pickering. The countryside is looking lovely and golden at the moment, the fields are littered with massive bales of straw, and tractors pulling farm machinery are trundling up and down the roads. Everyone is busy getting the harvest in. 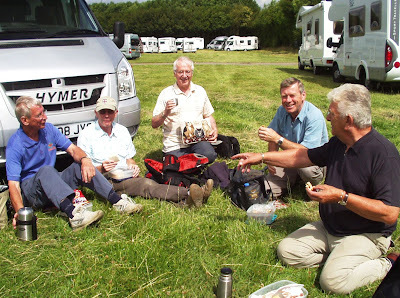 Not long later, the other drivers turned up, so we all had a picnic on the grass before we went back in the mini bus. I thought this was going to be an easy day, a pleasant drive out into the countryside, then go home. I was mistaken, we all went back to pick up a second vehicle. Although I had the option of only doing one, I thought I would join in with everyone else and make two trips. Now I am ready for my bed, I'm nodding off at the computer, goodnight. It was all a bit of a rush tonight, I had completely forgotten that I had to give a trucking talk to the W I in the next village. I suddenly remembered at 6.20pm, there it was written on the calendar. They even rang last week to remind me, but I still forgot. It was a mad rush to get some scrambled eggs on toast for my tea, a quick change of clothes, then out. The ladies were waiting so I quickly set the projector and screen up and started immediately. They loved the talk, my sense of humour can be a bit erm, down to earth, no fancy big words, just open my mouth and see what comes out. I look around the room to read the expressions on their faces, that tells me a lot. Shock horror means tone it down a bit, fits of laughter means keep going, tell them some more stories like that. It's knowing how far you can push boundaries, and adapting your talk to suit the type of audience. I have no problem speaking to a large group of people, in fact the bigger the audience the easier it is. A few months back I had an audience who hardly raised a smile, nothing I said made any difference, they all sat there with blank looks. My goodness I worked hard but it was hopeless, what a miserable lot. But that is very rare, tonight the ladies went home very happy, which made me happy. I've had a fab day out at Jerry Green's Dog Rescue open day today. 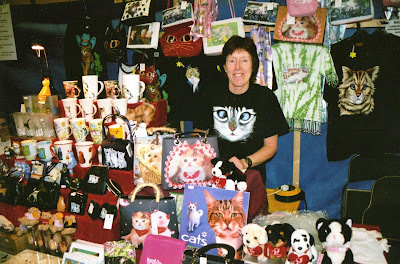 I have been going to this event for several years, first with my cat business, I sold fancy goods and gifts with a cat theme, and last year I did a charity stand and gave the proceeds to Jerry Green. This time I took the Scrapstore stand. Although I was working I had time to have a mooch around as Lorraine was with me. There was a car boot sale on as well, and I was chuffed to find a big plastic box of nails for £1, a great find as I had run out of that particular size. I had a stroll round the dog pens and read some of the details of the dogs, which were on a board outside each pen. It was heartbreaking to see so many abandoned dogs waiting for some kind soul to take them home. I watched a little girl for a while who was looking longingly at a small friendly dog who was jumping up at the wire fence. I could tell she was smitten by it, I hoped her mum and dad would see how much she wanted to take it home. I couldn't look at all the dogs because I found it too upsetting, how could people abandon their pets! Maybe some of them had lost their owners for other reasons, still very sad when you think they might never find another home. I have got a serious case of crafting confusion, a befuddled brain you might call it. So many ideas in the pipeline, so many things to make, but where do I begin? There are some good ideas on the internet, must have a go at that I think, put it on the 'to do' pile, the pile is growing steadily by the day. Whoa, that's enough. I was hoping for a day out today, but it's my fault it didn't materialise, I should have gone out early. Instead I was looking for some info on the computer and the phone rang. It was a factory we had picked up some scrap from a couple of weeks ago, they said they had some cardboard tubes and could we come an collect them. I thought I had better go because if they think we are not bothered they might not save stuff for us again. They were like huge, very thick, toilet roll middles, all different sizes. The tyres started to look a bit squashy on the back because of the weight, so I thought I would only take half of what they had and promised to go back next week for the rest. After unloading them at the Scrapstore I went round to my tyre place to get them checked out, they told me in January that one on the back was getting towards the end of it's life, the tread being a bit low. He got his gauge out and declared they were all legal, so I got him to check the pressures. He said come back in a couple of months. By now it was lunchtime so it wasn't worth setting off anywhere with half the day gone, so after a sandwich, I set about taking some pallets apart that I have stored in my garage. 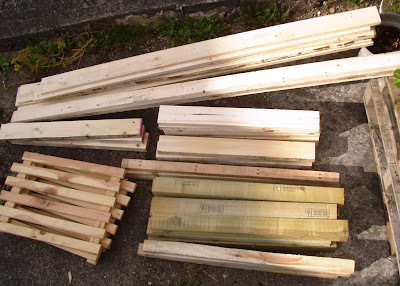 I don't know what it is with me and pallets, if I see some good quality clean ones at the back of Wicks I can't drive by, I have to pick them up. They said any that are on the grass verge are free to anyone who wants them. I want to make something with them but not sure what yet. I've had a great day collecting things for the Scrapstore. I met Becky in town then we went to meet a works manager from a well known furniture manufacturer, they make three piece suites. He showed us around the factory so we could see what kind of scrap they generate. It is such a big factory and they have so much waste, they sell as much as they can for recycling. There are large skips for cardboard, plastic bags, and wood, so they make money on those. But, we did get a lot of upholstery fabrics, some quite large pieces, and many different designs and colours. Also some leather offcuts, and leather sample swatches. The factory line manager was instructed to bring us out some sheets of wadding, foam sheets, and wood pieces. A fantastic find, my estate car was full to the roof, and we can go back there every two weeks. After unloading that, we went out again, this time to a factory we visited last week, the manager had rung and told us to come for more. They have massive bags of polystyrene beads, the type they put in bean bags, and they also had a lot of boater type hats they made but have some left over. These are ideal for children to decorate. Again the car was filled to the roof. After a cup of coffee and a biscuit back at the Scrapstore, we were suitably refreshed to go out again. I was now getting quite excited about finding more stuff. We went back to the vinyl man, and had another dive in his skip, he gave us a contact to visit who might be able to give us something, a small company that makes holdall type bags, so after we picked out a lot of wood from the skip next door, we went to see him. The boss was very enthusiastic about what we were doing, he said he would get some stuff bagged up for us and deliver it himself on Saturday. We had heard about a company that has massive sheets of foam on the same industrial estate, and managed to track them down. Sure enough a young lad brought it out to us on a pallet. After stuffing as much as we could into the car, we had to admit defeat and take it back to the Scrapstore, saying we would come back another day for some more. We are now beginning to build up good relations with several businesses, and regular collections are being organised, much better than throwing it all in a big hole in the ground. We are only able to do a little bit towards recycling, a lot more effort is needed. Our premises is not really big enough, what would be wonderful is a Scrapstore on every High Street, how fantastic! The garden is looking good. It's so nice being able to pick fresh veg and have it on the plate within twenty minutes. I have an abundance of peas, but I am not sure which are mangetout and which are ordinary peas, as they are all mixed up. So I am eating them with the pods when they are small and flat, and shelling them if I have missed them and the peas are fat. There are loads of spuds in the raised beds and some in pots, I am sticking my hands down and pulling a few out at a time. 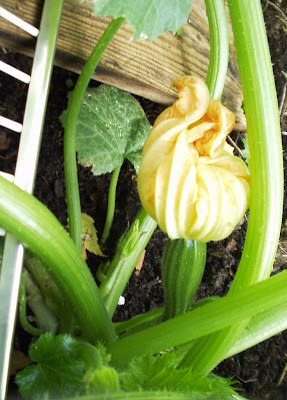 The broad beans are nearly ready, and the first courgettes are appearing. It won't be long before the beetroot is ready, might pull some in the next few days, I love cooked beetroot. 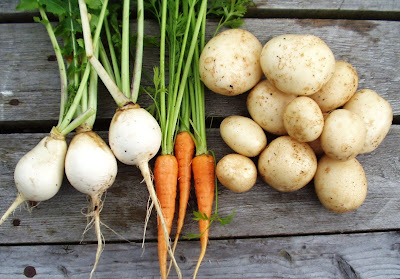 There are a few carrots ready so I am pulling them to make room for the rest to grow, same with the turnips. I have been eating the broccolli, should be quite a lot of that as the plants look big and healthy. The brassicas are under net curtains over a frame, I made the mistake of taking it off too early last year, so they are staying covered. With a bit of luck I will have sprouts and cabbages later on. The tomatoes are coming but won't be ready for a week or two, I was a bit slow at getting them started this year, also the cucumber plants are only a foot high, but they will come eventually. I'm surprised I haven't had as much trouble with slugs and snails this year, could that be because I have been collecting them up over the last two years, and there aren't many left I wonder. What a busy day we had today at the Winterton Show. I picked Becky up at 8.15 and ten minutes later we were pulling into the Showground. We found the marquee and unloaded, then set about errecting the stand. I had brought our own tables to keep costs down, so all we had was a ten foot square of grass to work in. Out pitch was in the centre, it would have been better against a side or back wall, but as it was a two day event and we didn't attend yesterday, all those pitches were taken. In this situation you have to think of other ways to build height into the display. As I have been building stands for three years in a previous business, I have a pretty good idea on how to make it eye catching to draw the visitors in. My dad once told me I should train to be a window dresser when I left school, advice I chose to ignore, but now I realise I could have excelled at it. Funny how things go round in full circle. Anyway this is the stand we built. It is two larger than normal, heavy, paste tables, one behind the other, with two smaller tables tagged onto the side. You have to be carefull not to encroach on your neighbours pitch, and to leave enough room to squeeze up the sides when you want to talk to a customer at the front. It's always a good idea to take more than enough equipment with you so you can build according to the space you have. I only ever buy the smallest pitch size, sometimes if you are lucky and your neighbour doesn't turn up, you are asked to fill the gap, because gaps look unsightly. So your extra table will come in handy, I like extra free space. You usually buy space by the frontage at a craft fair in a hotel or hall, you will only be allowed six foot, so it is a tight squeeze. My tables are a tad too long for this, so I try and get there early and shuffle all the tables in the row along a few inches so I can get mine in. Cheeky I know, but it has to be done. You sometimes see people with just one six foot table, not enough space to display all their stock, they sit behind it knitting or reading. I always double up on the depth, sometimes not leaving enough room at the back for a chair so I have to spend the whole day standing. This is the sacrifice you have to make if you want to maximise your sales area. It is important to build height into it, there is nothing more boring than a flat display with a bed sheet for a table cover. I have got two, two meter lengths of timber with three coathooks on each of them. I clamp these to the back of the table with the big metal clips they use on market stalls. The hooks are facing the front, these support three cross bars. Then I hang anything on there with plastic clips, my bags are ideal for this. I pack the stock into those collapsible plastic crates, as these are ideal for elevating the display, put three of them upside down at the back of the table and cover with a cloth. I've just found another photo of a stand I built at a cat show in 2004, it's a good example of using height and elevation. Thanks to Vince Hogan of Our Dogs magazine for taking the photo. You can just see one of the timbers behind me, I clipped them to the back of some plastic drawers I carry stock around in, which are against the back wall. You are not allowed to put anything on the wall itself, in case of dammage. Lightweight teeshirts are also ideal to hang on this, as well as the bags. On the table I have a wooden display unit I built out of wood, and covered it in red velvet. It's like a mini staircase, ideal for putting smaller items on, here I have mugs and ornaments on it. I digress, the day at Winterton went very well, we talked to lots of people and gave out a lot of leaflets. We are hoping a lot of them will visit the Scrapstore in the next few weeks. By 4pm the crowds were thinning out a bit, but a sudden downpour brought them all back into the marquee again, sometimes the rain is a blessing at a show, provided it doesn't last too long and send them all home. By 5pm were were packing up, and next Sunday we are doing it all again, at Jerry Green, a local dog rescue centre open day. I have booked more space for that one because it was a cheaper price. I know a lot of people from doing these shows selling my cats, so it's great to do them again and say hello to everyone. Good morning, walk all done and dusted, didn't get any shuteye and didn't need it. There was a great party atmosphere last night, over 500 women most in their night wear or fancy dress, me in my pink nightie, it was a lot of fun. I decided to walk alone because I wanted to push myself hard and do it in the shortest time I could. We set off at 10pm from the football ground, and I was in the second bunch of thirty to get off. The pace was quite fast throughought, we had two curcuits of six miles each, with a twiddly bit in the middle making it a total of thirteen miles. The second circuit was the same as the first, in reverse. There was a lot of car horn hooting going on as we looked quite a spectacle, a lot of flashing lights on heads, mine were fastened to the waist band of my bumbag. Plenty of watering holes dishing out bottles of water and chocolates, and marshals, ambulances, St John's, as far as I could see no one needed their assistance but it was comforting to know they were there. The conditions were ideal, dry, slightly warmish, although my skin felt cool I was comfortably warm inside. I thought my feet might give me problems but they didn't, I wore an old pair of trainers, a bit like a comfy pair of slippers. I even managed to run part the way round the second circuit, overtaking a lot of young ones. On the last straight I could see the three hour looming, with seven minutes to go I had one last push, determined to be within the 1am deadline I set myself. I know it was supposed to be a fun walk, but I do like some element of competition, even if it is just competing against my own boundaries. I received my medal at 1am as I checked back in at admin. Breakfast was provided inside the football ground and I opted for the bowl of fruit as opposed to the bacon butty. I sat for ten minutes looking out over the pitch, imagining the roar of the crowd as a goal is scored, only ever hearing a real roar from the Tesco car park across the road. With my goody bag in my hand I got back in my car and drove the ten minutes home. 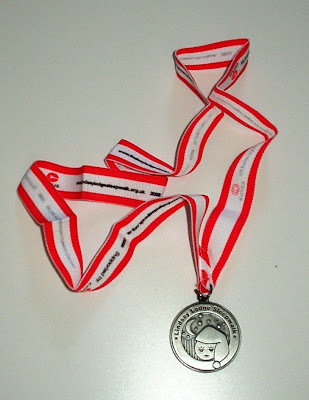 Here is my medal. Today I feel great, pleased with my achievement, and looking forward to the day ahead, I'm off to the Scrapstore soon to pick up what I need for the stand tomorrow. Have a good weekend. 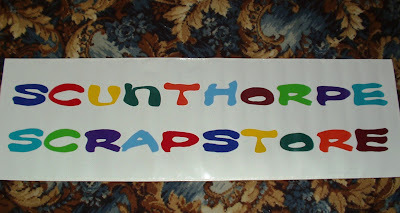 I've been busy making a banner out of the vinyl offcuts, for our stand at the show on Sunday. I did the letters on the computer, printed them and cut out templates. Then I found ten different colours for the ten letters in each word, and drew round them with a pencil. Cut those out with nail scissors, and put a backing onto each one with very strong, two sided tape, cutting it to fit the letters exactly. I found a piece of white vinyl just the right size, 5ft 2ins x 1ft 7ins, and hemmed the edges with the sewing machine to strengthen it. This is the finished banner. We don't need eyelets putting in because it is going to be attached to the front of the table. I'm very pleased with how it has turned out, it's very colourful, total cost, zilch. Now I have got to get ready for the sponsored walk tonight. I hope to get an hours shut eye first because I will be walking 13 miles, starting at 10pm. So think of me when you are snuggled up under your duvet, I hope to be under mine at around 3am. Skip diving, I love it! 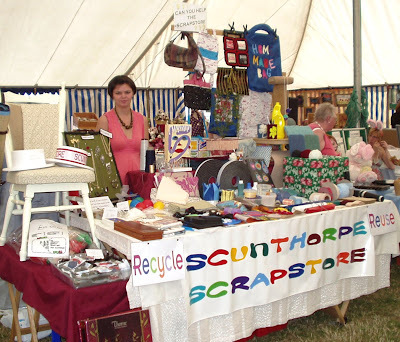 I have now got an excuse to rummage through other peoples rubbish, I have offered my services as a collector for the Scrapstore. 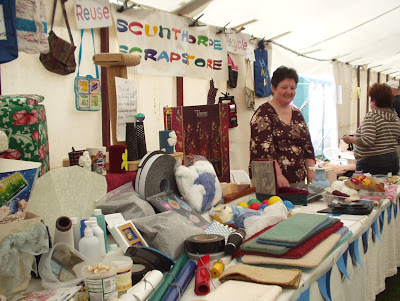 It's great fun, Becky and I have been visiting businesses to ask if they have anything they are going to throw away, and could we please have it because we can recycle it and make something with it. They have to pay for their rubbish to be taken away, so if we take what we want first it's better for them, less in landfill, and it gets reused for something else. People have been ever so accommodating to our request, they take us on a tour round the factory, show us how the raw materials are turned into the finished product, and we are able to identify any waste that might be usefull to us. Some people tell us they have nothing suitable, but when we look around we usually find something. It's all very interesting and a great excuse for being nosey and asking questions. Today I was removing a lot of vinyl off cuts from a bin when the lorry turned up to empty it. The driver said, 'Carry on, I'll do next doors first', then he wheeled the other bin out. There was a lot of clean wood in it, so I said, 'Wait a minute, I want some of that as well'. He then proceeded to help me fill my car from both bins before he tipped them up into the lorry. It was so funny, and I was filthy with all the dust. I think I have found my forte with this job, it's right up my street. Now I can put everything I learned from 'The Apprentice' into practice. How to get your foot in the door, how to talk people into helping us, and how to fill an estate car with all kinds of usefull scrap. I've just had some extra money off vouchers in the post from Tesco Clubcard, I see there is one for £6 off a £40 spend, between 13th and 19th of July. I will start running down my store cupboard and freezer, eating what I have and only buying a few essentials like fruit and veg, so that I can use the voucher. My weekly grocery spend is only about £12 to £15, so I need to be quite low on food to justify spending £40. Hello, I am a 69 year old retired lorry driver. After trucking for 32 years I'd had enough, went part time when I was in my mid 50's and stopped altogether when I reached 60. Yippeeee, now I am free to do as I like. I live with two cats, I make do and mend being very careful with my spending, only buying what I need. I have no qualms about buying second hand from car boot sales and charity shops, and getting free stuff from skip diving. Money saved is put towards holidays, a decent car, and days out. I love life, and it needn't cost a fortune to enjoy it. We start our fourth year of the 1000 mile walking challenge on the 1st of January. Members of the International Walking Group will need to report in on the 1st of every month with their own mileage. If you feel that 1000 miles is too much for you, make up your own challenge. Any walking is better than no walking. The aim is to improve our health and fitness. Remember, you need to allocate time to do this, going for the odd ramble when you feel like it is not really enough. Walk fast, walk with a purpose. Onward we go. Let's work hard to keep in good shape. Retired and taking it one day at a time. Free things I have found, or been given, or I have asked for.